Lunar New Year (also known as the Spring Festival or Chinese New Year) lasts from New Year’s Eve (the last day of the last month of the Chinese calendar) until the Lantern Festival on the 15th day of the first month. The festival usually lasts about 23 days, and February 19 marks the New Year for 2015. The Chinese Zodiac calendar corresponds with one of 12 animals each year. The animals are supposed to predict what the year will be like. 2015 marks the year of the goat. The animals are supposed to align with personality traits, so people born during a year of the goat are considered to be dependable, intelligent, calm and charming! Help your kids find out what animal corresponds with their birth year. Some restaurants have calendars, or you can find our your zodiac animal online if you enter your birthdate. Nick Jr. also has these great coloring pages. As a part of Lunar New Year tradition, elders often give children “lucky money.” The money comes in red packets and intends to ward off evil spirits. Money can range from a few to thousands of Chinese Yuan. For a math lesson, you can teach your children about different currency. One U.S. dollar is worth a little over six Yuan. Be sure to head to the Symphony Center (220 S. Michigan Ave.) to hear music celebrating the New Year! The performance will feature the National Chinese Traditional Orchestra and the Chicago Symphony Orchestra. Tickets start at $20. 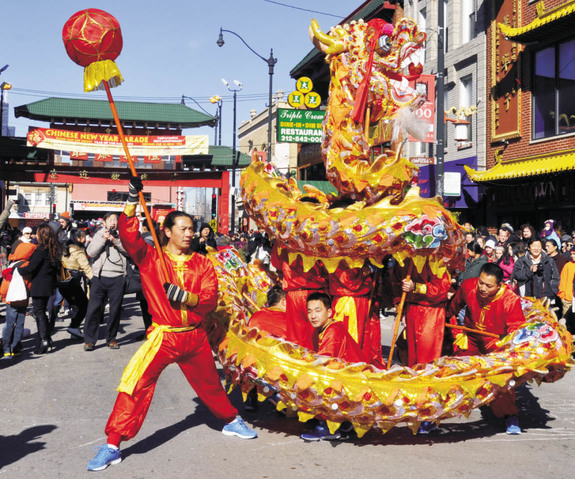 Head to the Chinatown Lunar New Year parade on Feb. 22. Watch the lion and dragon dances, listen to the bands and marvel at the floats that travel on Wentworth Avenue and Cermak Road. After the parade, be sure to stop at one of the delicious restaurants in Chinatown. For delicious dumplings and pot stickers, try Lao Shanghai (2163 S. China Place). Satisfy your sweet tooth at Chiu Quon Bakery (2242 S. Wentworth Avenue) for dessert. Try a sesame pork cookie or try a sweet bun. Can’t get enough of the Lunar New Year parade? There are many great books to teach your kids about this cultural tradition. Check out The Dancing Dragon about Lunar New Year traditions. This neat book tells the story of how the dragon arrives during the New Year’s parade. The Gift of Curiosity lists more than a dozen other great books to read too. To go along with the story, you can make dragon puppets too with these cool cutouts from Scholastic. The 15th day of the New Year marks the Festival of Lanterns. Streets become filled with lanterns and performances. Dancing dragons will perform in front of office buildings because the dragon represents prosperity and good luck. On March 1 at 12 p.m., be sure to attend the Chinese New Year Lantern Festival at Navy Pier. Head to the Crystal Gardens at Navy Pier (600 E. Grand Ave.) for a free event to celebrate the end of the Lunar New Year. The Crystal Gardens will be come a Chinese marketplace with vendors, dancers, musicians and artists. For a fun craft idea, you can even make your own paper lanterns, thanks to Enchanted Learning. 1. Fold a rectangular piece of paper in half, making a long, thin rectangle. 2. Make a series of cuts (about a dozen or more) along the fold line. Don't cut all the way to the edge of the paper. 3. Unfold the paper. Glue or staple the short edges of the paper together. 4. Cut a strip of paper 6 inches long and 1/2 inch wide. Glue or staple this strip of paper across one end of the lantern - this will be the handle of the lantern. 5. Optional: Make a lot of lanterns and string them along a length of yarn. Decorate your room! From February 16 through March 5, stop by State Street (between Lake Street and Van Buren Street) to see light and sound installations in the street planter displays in the Loop. Enjoy the synchronized color patterns choreographed to music in celebration of the Lunar New Year. Keep the Lunar New Year fun going throughout the month of February. The kids will love the bright and festive activities for this holiday celebrated around the world! How do you plan on celebrating the Chinese New Year? Share it with us below!